Just Asking: How Much Credit For Getting Osama Bin Laden Does Obama Truly Deserve? When I first heard about the assault on the compound in Pakistan that resulted in the death of Osama bin Laden, I was happy and proud as an American. And willing to give Obama credit where credit was due. It seemed like a gutsy move – which the mainstream media narrative quickly seized upon: the political consequences for Obama would have been quite negative if the mission had failed. It would have reminded everyone yet again that Obama is a reincarnation of Jimmy Carter. And the whole “Desert One” fiasco would have surely been remembered. But take just a second and look at it from the opposite perspective; you know, the one that the mainstream media has never once considered for even a nanosecond. What would have happened had Barack Obama decided NOT to try to take out bin Laden? What would have happened – more to the point – when the American people were informed that Barack Obama had known for certain where Osama bin Laden was, and refused to try to get him? Wouldn’t that have had even MORE DISASTEROUS consequences??? And, the thing is, it is a near certainty that that information would have gotten out. There would have been sufficient disgust in both the CIA and in the Pentagon that somebody would have made sure that the news got out that Barack Obama – who had PROMISED THE AMERICAN PEOPLE that he would go into Pakistan to get bin Laden – had cowardly refused to keep yet another promise. Imagine for just a second the abundant campaign ads: slow-moving video of Osama bin Laden, followed by footage of the twin towars collapsing, followed by Barack Obama giving his word to get bin Laden, followed by the evidence that Obama knew for at least half a year where bin Laden was hiding, and refused to even try to get him. It would have been just as “bold” for Obama to decide that an operation to get bin Laden was too risky, and jeopardized critical U.S.-Pakistani relations to too high a degree. Barack Obama was forced into a position where he had to rely on the U.S. military to save his political hide. And the U.S. military came through for him. President Obama has targeted the Department of Defense to absorb more than 80 percent of the cuts he has proposed in next year’s budget for discretionary programs. Does Obama deserve credit for that? Really? Is he out right now campaigning as the guy who just gutted the military he commands, or is he out campaigning as the commander-in-chief of a glorious military? People should hear that RIGHT NOW Barack Obama is taking an axe and gutting the Navy SEALs, and the Nightstalkers who brought them in and out of that compound, and the Screaming Eagles he visited yesterday, and the entire rest of the military. A former head of counterterrorism at the CIA, who was investigated last year by the Justice Department for the destruction of videos showing senior al-Qaeda officials being interrogated, says the harsh questioning of terrorism suspects produced the information that eventually led to Osama bin Laden’s death. Jose Rodriguez ran the CIA’s Counterterrorism Center from 2002 to 2005, the period when top al-Qaeda leaders Khalid Sheikh Mohammed (KSM) and Abu Faraj al-Libbi were taken into custody and subjected to “enhanced interrogation techniques” (EITs) at secret prisons overseas. KSM was subjected to waterboarding, sleep deprivation and other techniques. Al-Libbi was not waterboarded, but other EITs were used on him. “Information provided by KSM and Abu Faraj al-Libbi about bin Laden’s courier was the lead information that eventually led to the location of [bin Laden’s] compound and the operation that led to his death,” Rodriguez tells TIME in his first public interview. Rodriguez was cleared of charges in the video-destruction investigation last year. A former senior intelligence official says the waterboarding of KSM, quote, “took his spirited defiance into a zone of cooperation,” adding that the harsh interrogation tactic critics described as torture was not used to elicit information but rather to alter the detainee’s mindset. Philip Mudd is a former CIA analyst. PHILIP MUDD, FORMER CIA ANALYST: Having seen this stuff on the inside, that’s not a debate. That is a done deal. The information we got was invaluable. So debate the cultural side and the political side, but please don’t debate the intelligence side. HERRIDGE: In a radio interview with FOX, former CIA Director Michael Hayden said there is no question the CIA program including waterboarding laid the foundation for bin Laden’s capture. HERRIDGE: 2004 and 2005 are described as turning points. Both Khalid Sheikh Mohammed and Abu Faraj al-Libi, a gatekeeper for Osama bin Laden, were both in the CIA secret prisons. U.S. officials say for a second time, KSM downplayed the courier significance and al-Libi denied knowing him. 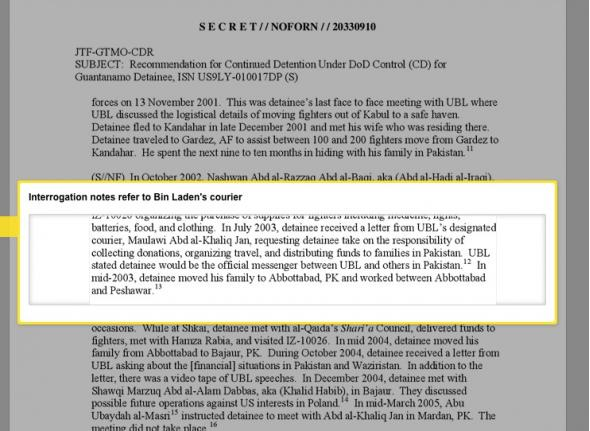 The men’s adamant denials appeared to be an effort to protect the courier and U.S. officials say it, quote, “sent up red flags for the CIA” because other detainees consistently claims the courier maintained bin Laden’s trust. Which is to say that the entire Obama presidency was spent mining information from waterboarding that Obama personally demonized and from a program that Obama shut down. And we now know that Osama bin Laden was in this compound that we learned about from waterboarding for at least five years. Every single major fact that we learned we learned from waterboarding and from enhanced interrogation techniques. And the rest of it was simply a matter of confirming what we knew from waterboarding and from enhanced interrogation techniques. People should KNOW that Barack Obama demands that the United States of America should be nearly blind. People should also know that on his second day in office Barack Obama shut down and terminated the CIA intelligence program that actually developed the information that got bin Laden. They should know that America no longer has that capability, and that thanks to Barack Obama we could never even begin to do that again – likely for years to come, given the difficulty of developing such intensive programs. In normal times, the officials who uncovered the intelligence that led us to Osama bin Laden would get a medal. In the Obama administration, they have been given subpoenas. Even NOW Obama is refusing to do anything to stop the prosecution of the men and women who gave us bin Laden, even as he flies around taking credit for getting bin Laden. Should we be giving Obama credit for that??? This nation should be grateful to George W. Bush, and for his courage and foresight to develop the programs and to create the capabilities that ultimately won us this victory against Osama bin Laden. It was the courage of George Bush that resulted in waterboarding – which Bush and his key advisors KNEW would be used by vile cowards like Barack Obama to demonize them. But they knew it had to be done, and they did it. In the same way, Bush created the Guantanamo Bay (“Gitmo”) detention facility. Bush expanded the rendition program that had been used by Bill Clinton. Bush created the Patriot Act. Bush approved of domestic surveillance. Bush set up the military tribunals that had been used by Democrats like FDR in previous time of war. Bush established the indefinite detentions of the most hardened terrorists. Barack Obama personally demonized and vilified all of these things. But he is using them to this day because they had to be done. I would argue that the hero of this is George Bush; and that Barack Obama is a self-aggrandizing coward who was forced to use virtually all of the programs that he self-righteously demagogued for political advantage in a way that is frankly treasonous. Right now we have a treasure trove of intelligence that is likewise nearly entirely the result of the work of George W. Bush. But be advised: if we don’t shut down al Qaeda now, we probably never will due to the massive failures of the man who sits in the Oval Office as we speak. It was always just a matter of time. And the time came during the misrule of a hypocritical fool.